Traveling cat spotted at the Wellington SPCA in New Zealand. 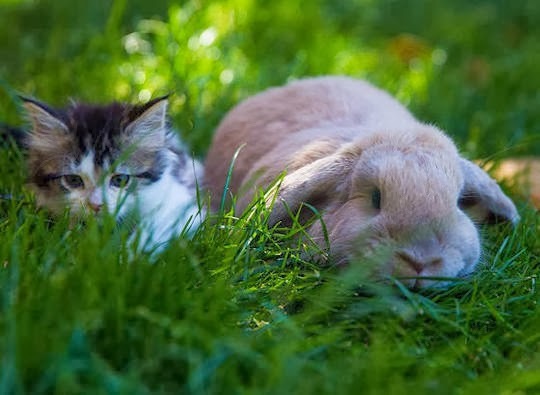 He's best friends with Pikachu, the foster rabbit. 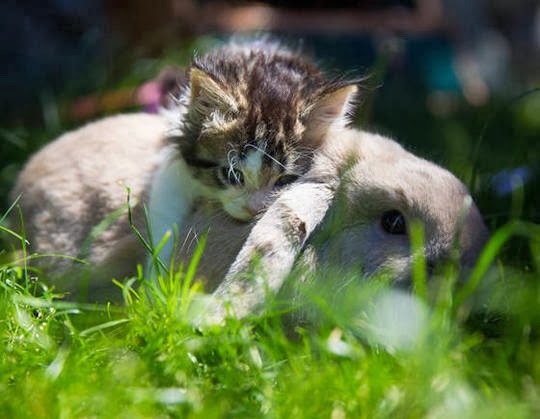 The kitten loves to climb all over his rabbit friend and nom on his ears. Now that is very sweet. Have a tremendous Thursday. Cuteness overload! And thanks for the blog award! Oh these pics are too cute for words. I always love these sweet animal friendships. Congrats on your award! Such adorable pictures. The photos are so sweet. Congratulations on your Blog of the Year award, and thanks for nominating my blog. Félicitations pour le prix et merci. Ils sont adorables tous les deux. J'aime beaucoup les lapins avec ce genre d'oreilles. Lapins bélier je crois. Congratulation son your award, Adorable pictures! Awwww... too cute! Congratulations on the award. Well deserved!